"She can tell when I'm sad or when I'm really happy." 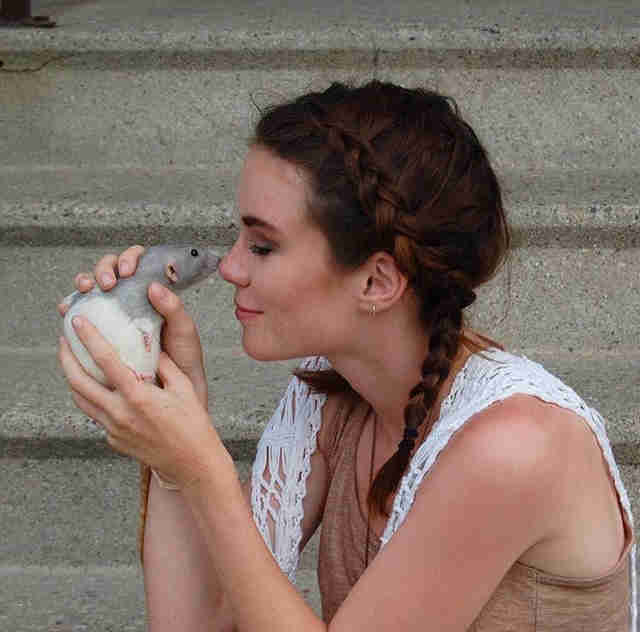 Dana De Graaf has loved many rats in her life - 18 to be exact. 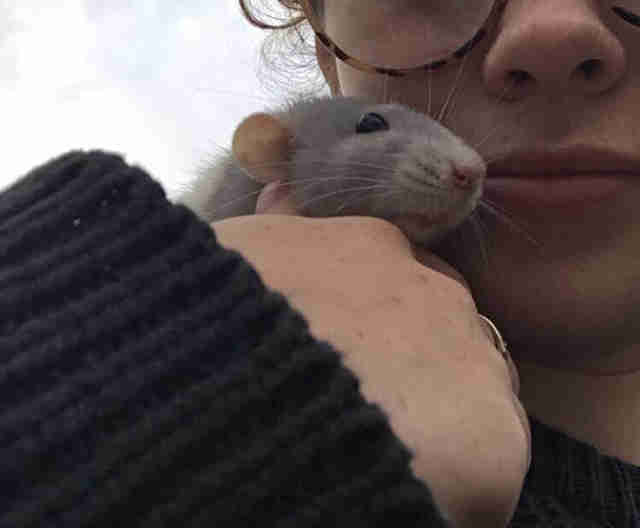 She was 6 years old when she got her first - a rat named Cheese who was a gift from her dad. 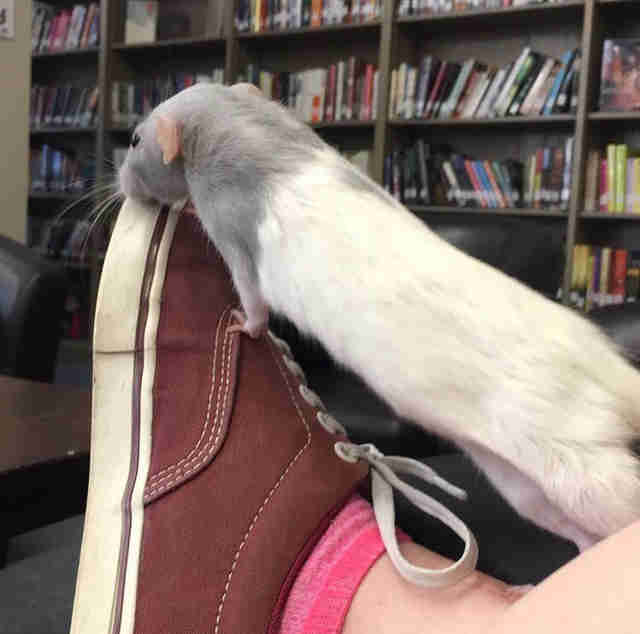 Now De Graaf is 17, and her love affair with rats hasn't subsided. If anything, it's probably gotten stronger. 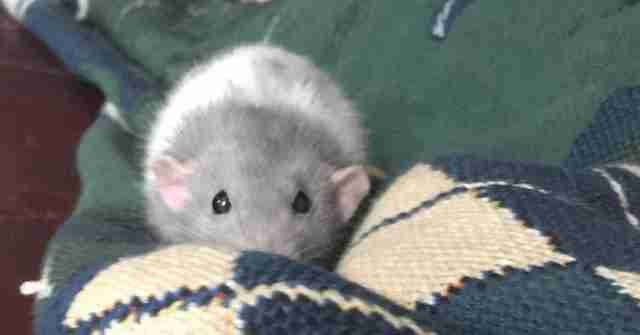 De Graaf currently has six rats in her care - Spoons, Stockings, Asia, Einstein, Bug and Newt. But for De Graaf, there's something particularly special about Spoons. "For the past two years, [Spoons and I] have done everything together," De Graaf tells The Dodo. "I love her to death. She's like my baby." De Graaf rescued Spoons and her two sisters, Stockings and Asia, from a bad home after her father got a tip-off. "They were just in a little fish tank, and it was really sad," De Graaf said. 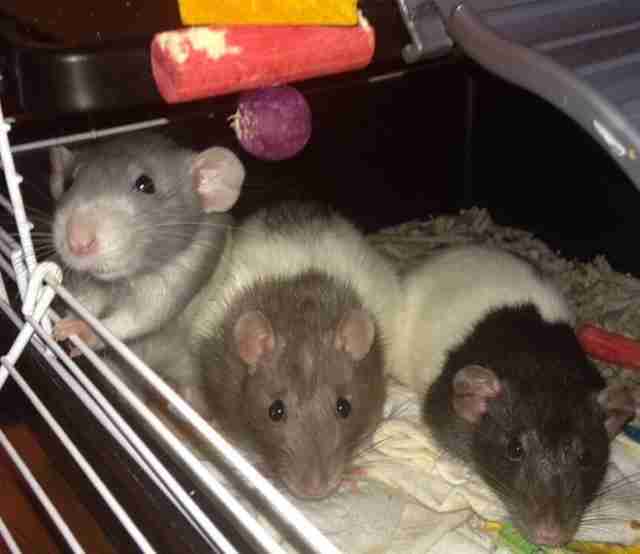 "They all had respiratory infections because the bedding they were using was awful." 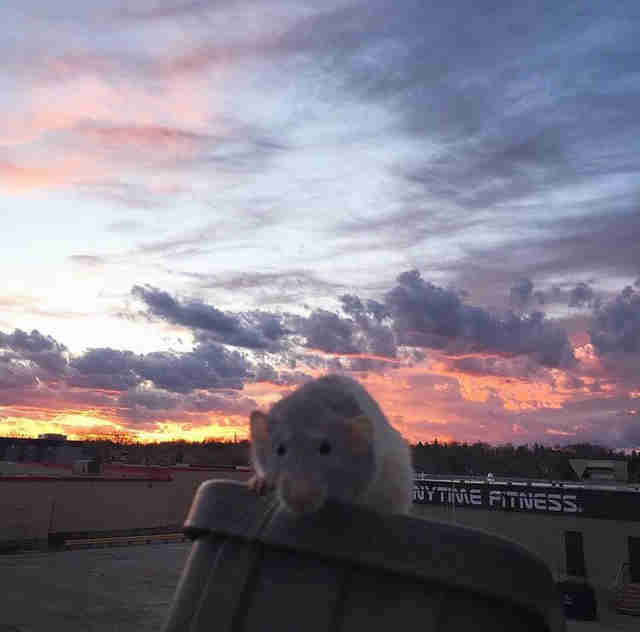 De Graaf took the rats to her home in Ingersoll, Ontario. She gave them big, comfortable enclosures, but let them roam free when she was home to supervise. And of course, De Graaf gave Spoons, Stockings and Asia lots of love. The rats, according to De Graaf, love her right back. Especially Spoons. "I got Spoons after I had a really, really rough point in my life," De Graaf says. "As soon as I got her, she caught right onto my emotions. She can tell when I'm sad or when I'm really happy. She can tell when I want to play with her and when I want to cuddle. She's just so easygoing and understanding of my needs, and I'm really in tune with hers. 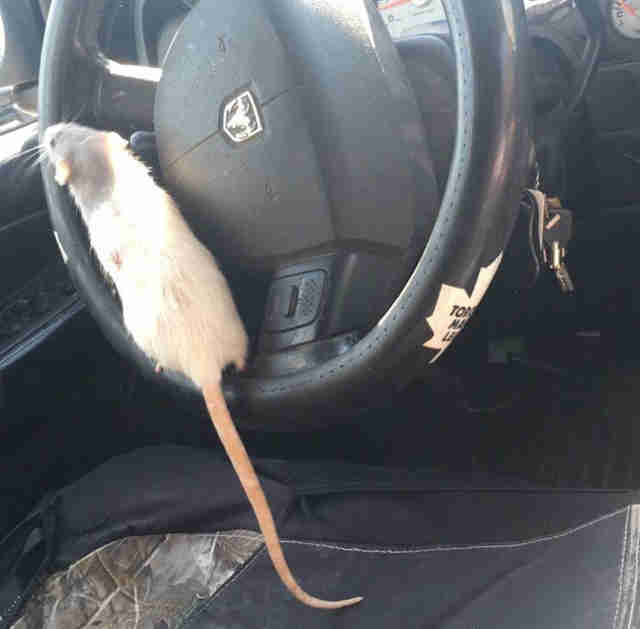 It's kind of alarming actually, because you wouldn't expect a rat to be empathetic." Their connection is so strong, Spoons can't stand to be away from De Graaf. "She's very attached to me - very clingy, kind of like a small child," De Graaf says. "She gets anxious and antsy when I go to leave her." To quell Spoons' anxiety, De Graaf started carrying Spoons on her shoulder and taking her out with her. The first place they went together was the ice cream parlor. "I live right down the street from an ice cream parlor, and I took [Spoons] with me," De Graaf recalls. 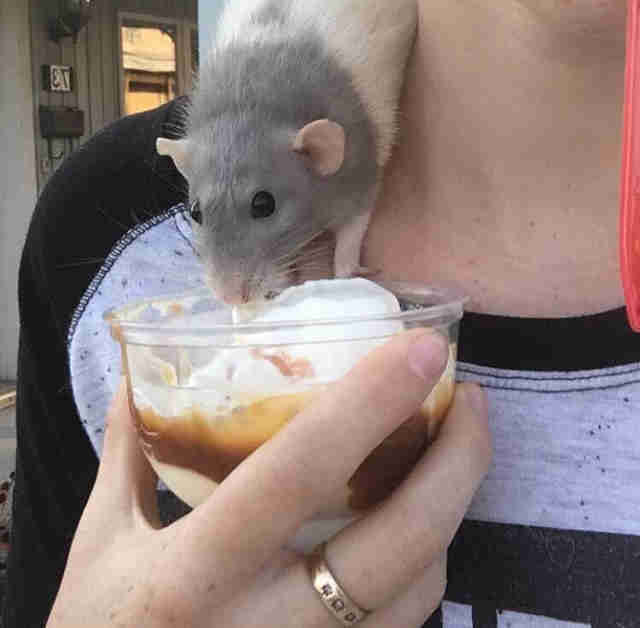 "I got a sundae, and I gave her a little spoonful of it, and she was just the happiest rat in the world. Ever since then, she's just been right there by my side." Car rides, shopping trips, walks around town - Spoons goes everywhere De Graaf goes. She even goes to school. "The teachers love her," De Graaf says. "Whenever I bring Spoons into [my French] class, [the teacher's] always like, 'gimme, gimme, gimme.' 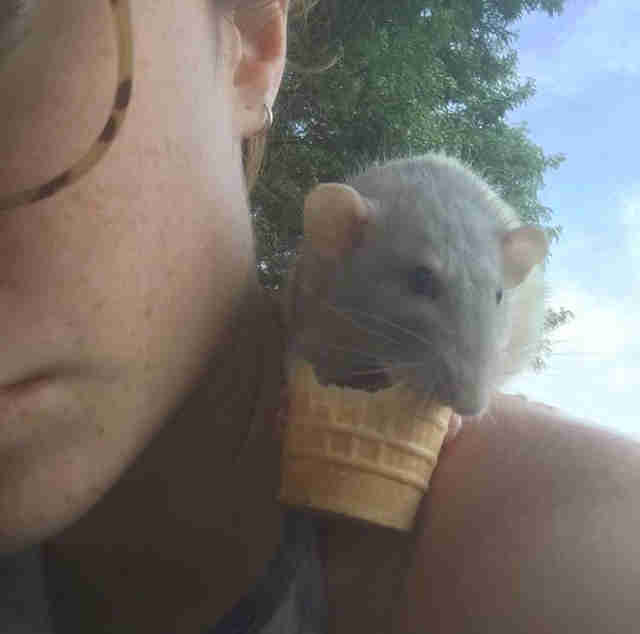 She takes Spoons and puts her on her shoulder." "Spoons was even in my school yearbook," she adds. "I took her to school and everybody loved her. They dubbed her the unofficial mascot. It's really funny." Spoons loves her outings, according to De Graaf. "She loves going outside," she says. "Whenever she hears me put my coat on, she jumps up to the side of the cage and stares at me until I take her out." 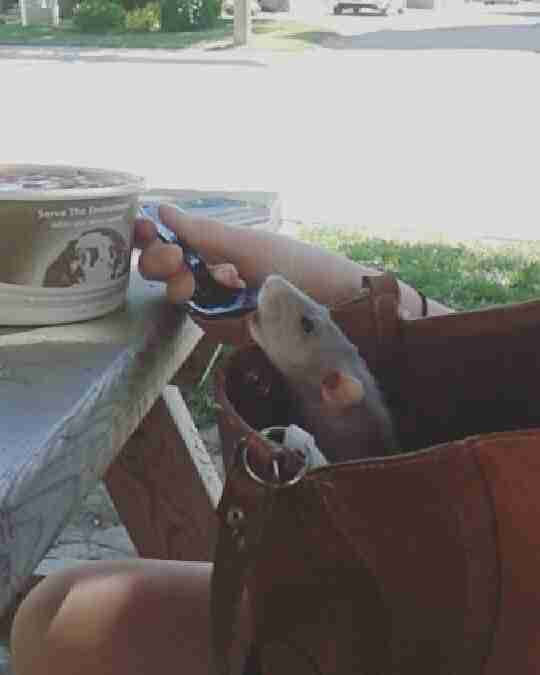 When Spoons gets tired, she'll take a nap - even on the go. 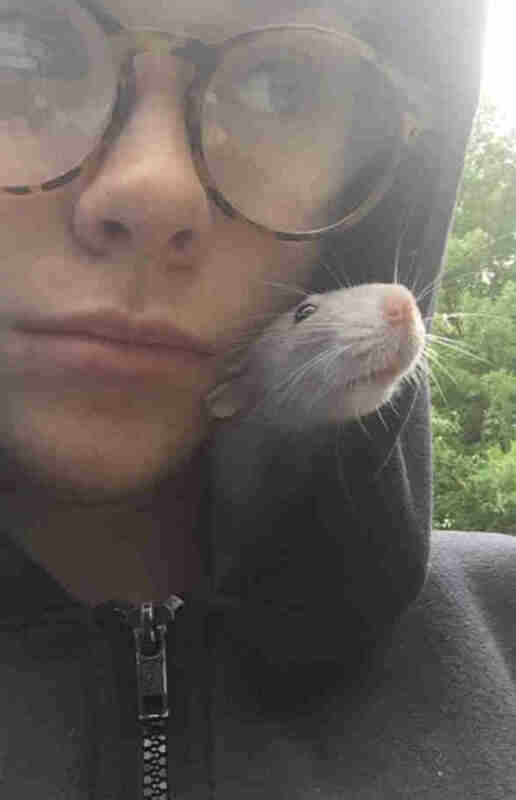 "She'll take naps on my shoulder or falls asleep in my hood," De Graaf says. "It's pretty cute." When Spoons isn't taking naps or going for adventures, she loves hanging around the house, doing what rats do. "She's a little bit of a sneak," De Graaf says. "If I'm eating anything, like cereal bits or pasta, I'll give her a little piece, or just fruits and veggies. 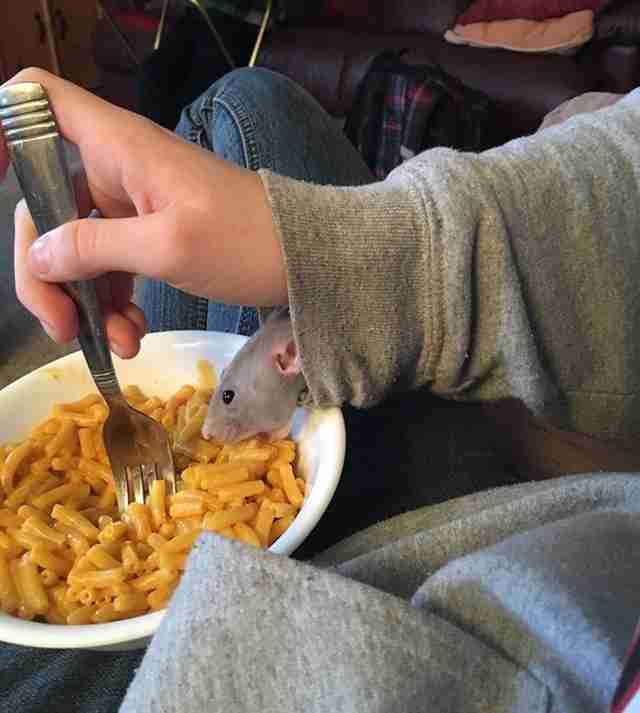 I let her out on the couch, and she runs from the couch to the chair to the other chair and the [cage], and she'll just run around there and hide food under pillows and stuff." Spoons also enjoys being cuddled. "She really likes to be pet behind her ears," De Graaf says. "Whenever I do, she chatters away. And she gets all happy. 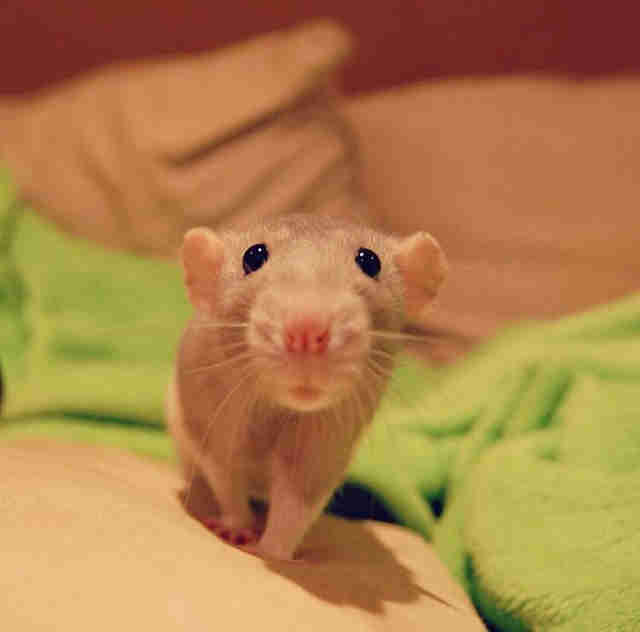 And when rats are happy, they do this thing called boggling when their eyes boggle in and out of their head. It's a little bit scary, but it just means they're really happy." 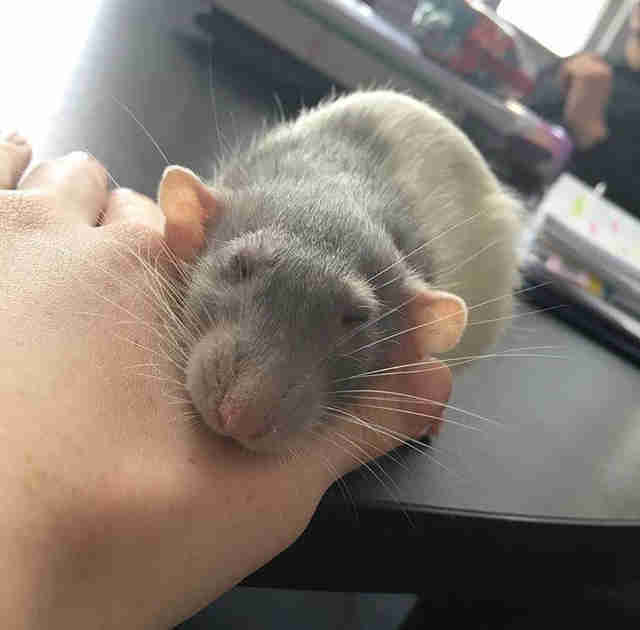 De Graaf couldn't imagine her life without Spoons and the other rats, but she knows rats may not be everyone's cup of tea. 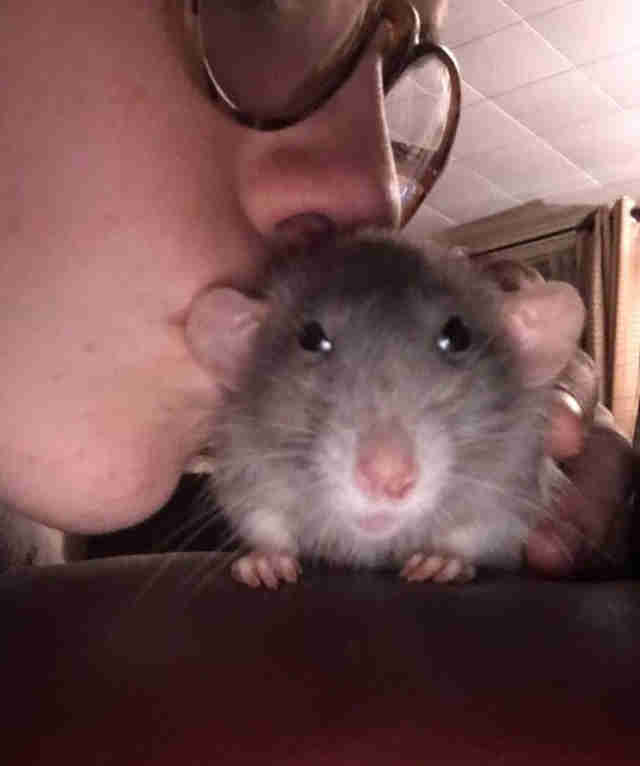 She hopes, however, that more people will learn to love rats as much as she does. 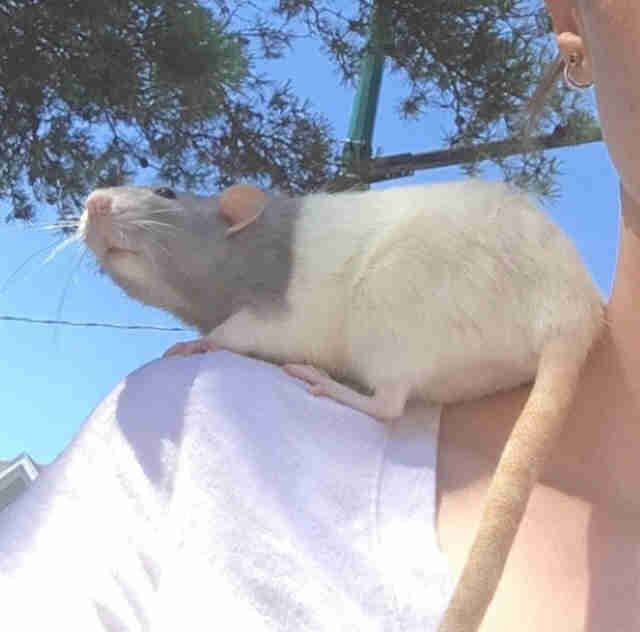 "The misconception [about rats] that I hate the most is that they're dirty animals, because they're really not - they're cleaner than most dogs or cats," De Graaf says. "They're also smart - they know their names. They come to me if I call them, like a dog does." 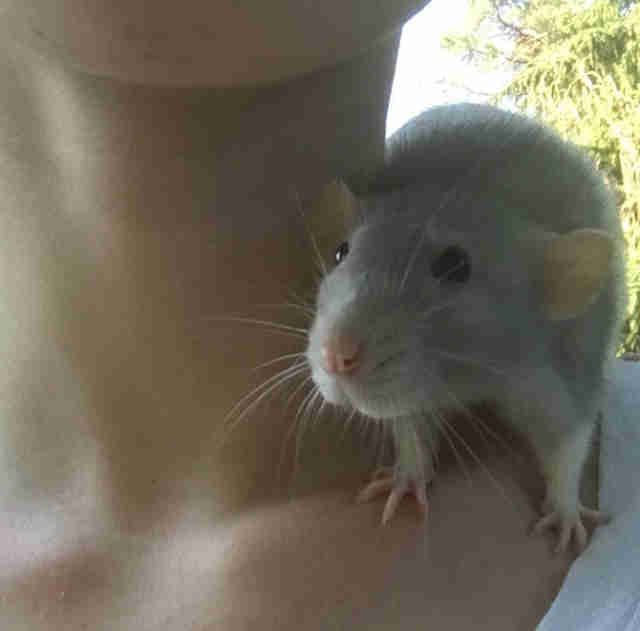 To follow the adventures of Spoons and De Graaf's five other rats, you can follow their Instagram page.